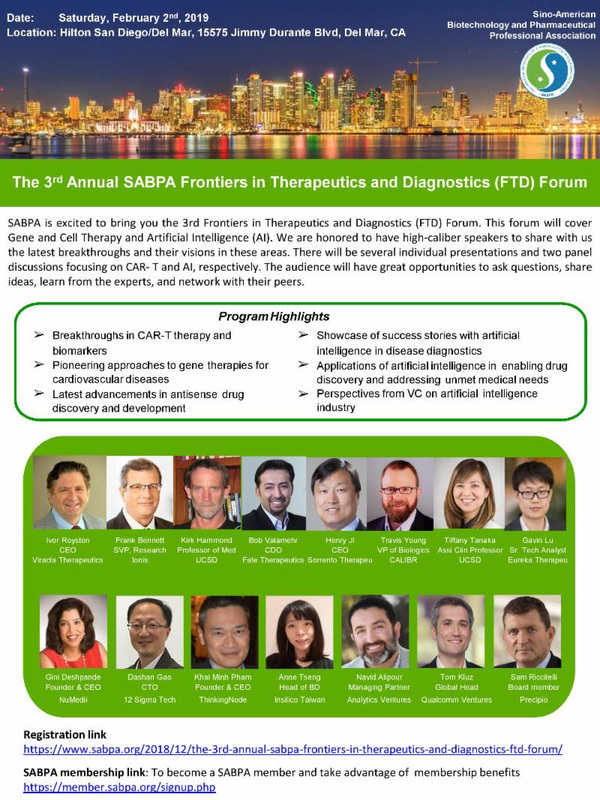 There is only one day left to register for tomorrow’s 3rd Annual SABPA FTD Forum! If you have encountered problems registering on-line, please come to the event and we will offer you on-site registration at the on-line discount rate. We don’t want you to miss this wonderful events due to registration glitches. We have volunteers on-site to help you complete the registration, all you need is a credit card! 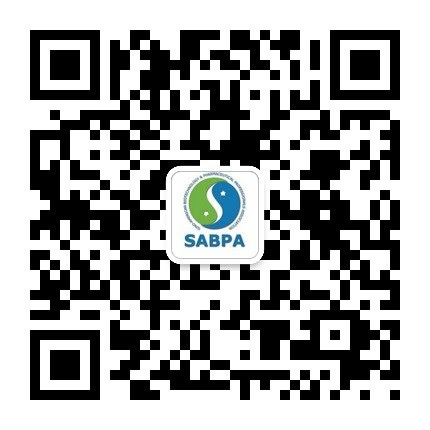 SABPA membership link: To become a SABPAmember and take advantage of membership benefits. 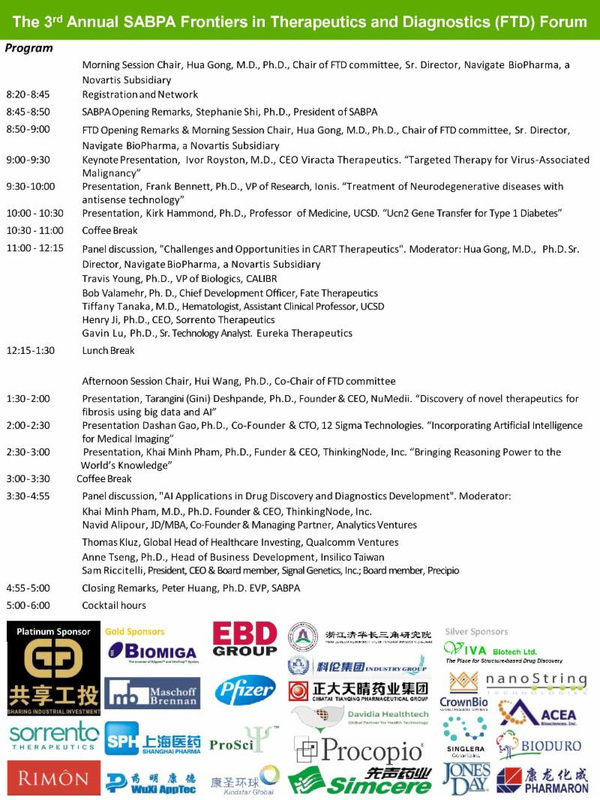 This forum will cover Gene and Cell Therapy and Artificial Intelligence (AI). We are honored to have high-caliber speakers share with us the latest breakthroughs and their visions in these areas. There will be several individual presentations and two panel discussions focusing on CAR-T and AI, respectively. The audience will have great opportunities to ask questions, share ideas, learn from the experts, and network with their peers. Dr. Yi Liu will share the key elements from his experience in transitioning from a scientist to an entrepreneur. Registration: http://www.sabpa-ocla.org/(Free registration and parking) or send an email to sabpa.ocla@gmail.com. Yi Liu, Ph.D., is the Chief Scientific Officer of Wellspring Biosciences Inc., a private biopharmaceutical company he co-founded in July 2012. 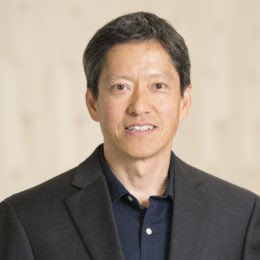 From October 2014 to November 2018, Dr. Liu served as the Chief Scientific Officer of Kura Oncology, a public company he co-founded in October 2014. Dr. Liu also co-founded Intellikine, Inc., a private biopharmaceutical company, where he served as Vice President of Drug Discovery from 2007 to May 2012, until its acquisition by Takeda Pharmaceuticals. Prior to Intellikine, Dr. Liu was the head of the drug design group at the Genomics Institute of the Novartis Research Foundation. Earlier in his career, he held senior scientist positions at both SGX Pharmaceuticals, Inc., a public biopharmaceutical company which was acquired by Eli Lilly and Company in 2008, and Curagen Corporation, a public biopharmaceutical development company. Dr. Liu received his Ph. D. in Biochemistry from Princeton University, his MSc in computational chemistry from Beijing University and his BE in Chemical Engineering from Tsinghua University. Use “SABPA20” to enjoy 20% discount for SABPA members (off regular rate). ChinaBio® Partnering Forum returns to Shanghai! 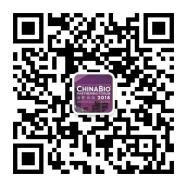 The 11th annual ChinaBio® Partnering Forum will be held on May 8 – 9 in Shanghai, China’s life science hub. China continues to be the world’s fastest growing healthcare market and is expected to be the #1 market in the world by 2020. The event is the largest and most productive life science partnering conference in China, and brings over 1400 leaders from across the life science value chain. Registration and partnering information is available at www.CBPF2019.com. Think about the purpose of your email: You want readers to respond in a certain way, so make sure to spell it out for them. Use specific calls-to-action such as visit our website, shop the sale now, or sign up for specials.